On this most auspicious day, 1 Ajaw, the namesake of the Hero Twin in the Popol Vuh, we welcome the Gregorian New Year, and we look forward to the 5th International Congreso on Ancient Maya Writing to take place in 2020. Working with Omar Chan of Quintana Roo and the Congreso planning committee, we have proposed a tentative date for the next Congreso to take place on this same Tzolk’in day 1 Ajaw, on June 22nd, 2020. This is just two cycles of 260 days in the future, which was a known cycle that Maya astronomers used to predict eclipses. Quite remarkably, there will be a total lunar eclipse tomorrow night, on January 20th, visible in the Maya area and in North America, and there will be a total solar eclipse on the summer solstice in 2020, just one day prior to the proposed Congreso date—though this solar eclipse will only be visible on the other side of the Earth—so we are safe! Following our announcement that we have funding available for our next round of mini-grants, we now have received twelve applications and we continue to receive more. We will fund as many as our budget allows, and I will announce the recipients in our next blog. This month, we take a look at a report from last year, but I want to make sure that we do not neglect to publish it. Juan Jesús Méndez Intzín, or Xun as I know him, is an extraordinary person, and one of the advanced students who regularly attends the Congresos. He is a native speaker of Tseltal from Chiapas, and one of a new generation of Maya people who is also an archaeologist, working towards his graduate degree in archaeology. 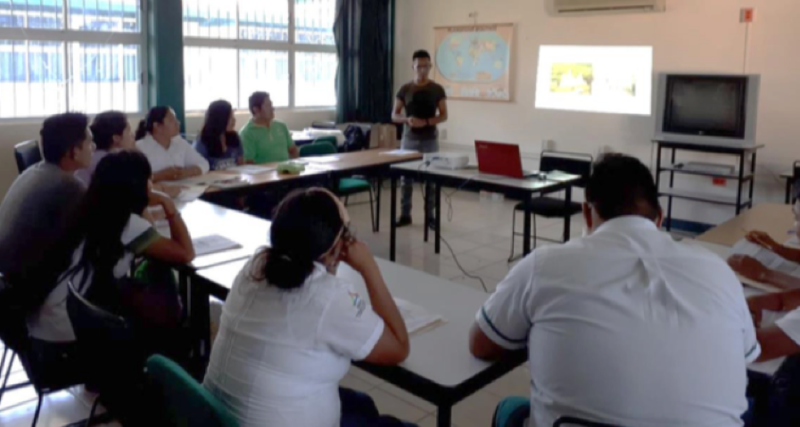 Juan organized and taught an extensive introductory course on Maya writing for Maya students at the Colegio de Bachilleres de Campeche (COBACAM) in Xpujil, Campeche last April, including a visit to the site of Becan. This area, surrounding the large ancient site of Calakmul, has been one of the most heavily looted regions in the Mundo Maya, and part of Juan’s interest is to help prevent further looting through education, helping Maya people appreciate their rich heritage. Juan’s groundbreaking work has been made possible by the generous contributions of donors like you. We are eternally grateful for your help, and for the important work Juan is doing, and we wish him well in his future goals. May there be many more native Maya archaeologists that follow in his footsteps. 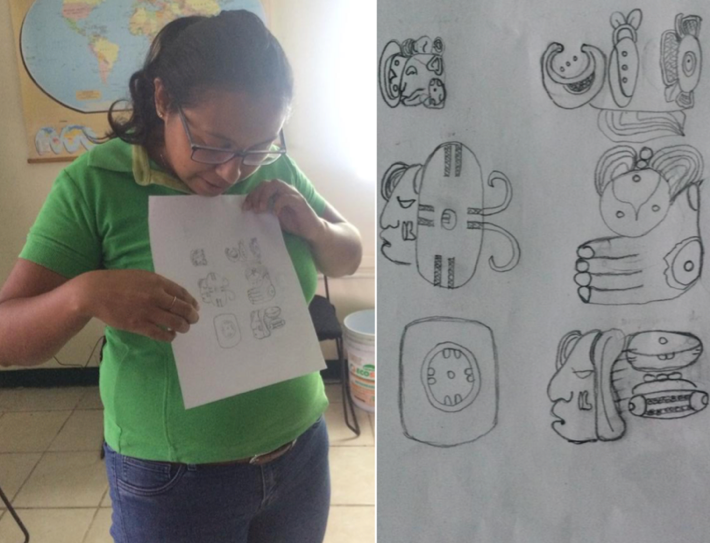 This report is the result of the activities carried out as part of the course-workshop called “Introduction to Maya Hieroglyphic Writing” in the facilities of the Colegio de Bachilleres de Campeche (COBACAM), campus # 14 with headquarters in the municipality of Xpujil, Calakmul, Campeche (Mexico) in April 24-26 of 2018. This was organized for community members with no knowledge about the subject. One of the largest municipalities in the state of Campeche, Calakmul is located in the south of the Republic of Mexico. It comprises the southeast of the same state, in the center of the Maya Lowlands and immediately north of the Petén. The archaeology carried out in this place has shown its importance as one of the most populated regions during the pre-Hispanic era; after its abandonment, nature took over to protect the material culture of our ancestors, which has been an object of great interest for a long time. The growing population in recent decades in various parts of the state of Campeche, with emphasis on this municipality, has led to the practice of illicit trafficking of archaeological pieces and therefore, the destruction of our valuable cultural legacy that lies within the Mayan jungle; among them we can mention some of the sumptuous vessels as well as the stelae, which narrate stories of the ancient Maya. It is a multicultural region; which means that many of the families come from neighboring entities such as Chiapas, Tabasco, Yucatan, Quintana Roo, Guatemala, Veracruz, among others. This leads to meeting people of Mayan Ch’ol, Mayan Yucatec, Mayan Tseltal, Maya Tsotsil, Maya Kakchiquel, etc.—people heir to an ancient culture that has not been valued and disseminated. 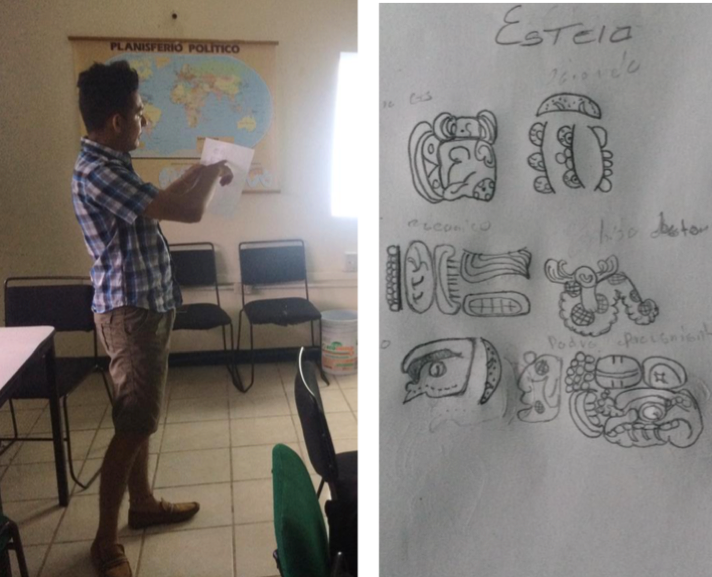 The general objective of the course-workshop was to make known the writing system of the ancient Maya. As well as inducing the participants to revalue, preserve and disseminate our tangible and intangible cultural heritage. The methodology established for the teaching of this course included some theoretical and practical aspects, for which the following books were used: Between a River of Oaks: An approach to the archeology of the Rio Bec region, written by the Mexican archaeologist Ricardo Bueno; Write with Mayan glyphs: Names, places and simple sentences. A non-technical introduction to the Mayan glyphs, by Mark Pitts in collaboration with Lynn Matson; a second book by Mark Pitts himself named Mayan numbers and the Mayan calendar. A non-technical introduction to the Maya glyphs; and the work of Harri Kettunen and Christophe Helmke Introduction to Mayan hieroglyphs. 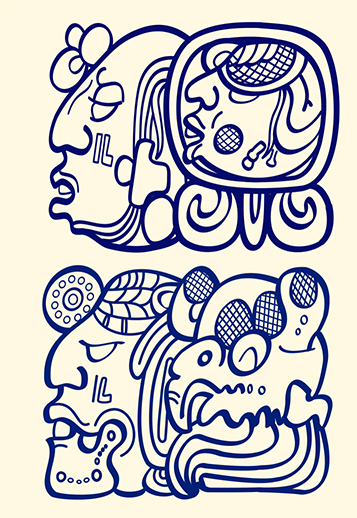 The last three contain knowledge and management of the basics of Mayan hieroglyphic writing. According to the books mentioned above, a workbook was prepared, with copies provided to each of the participants. It included the following: 1) terms used during the course, 2) the basis of the Mayan script, 3) the syllabary, 4) the logograms, 5) the numbers, 6) the calendar and 7) some exercises. 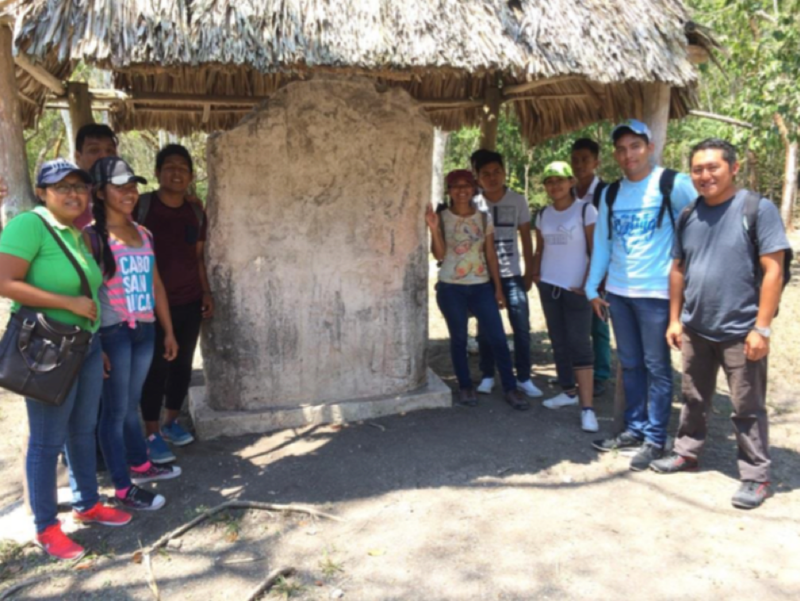 For a better understanding, we visited the archaeological site of Becán in order to know and study the few stelae present in it, as well as to understand the historical-cultural context and the importance of the site. 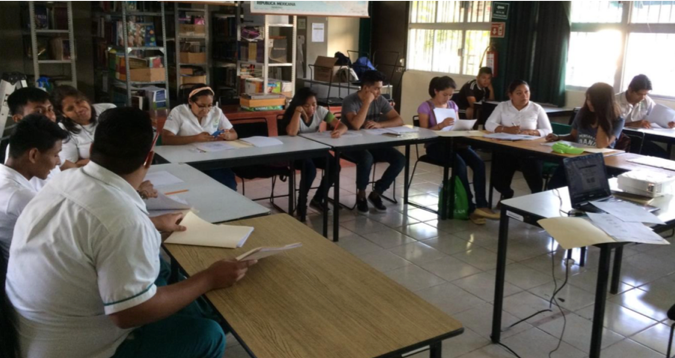 The course-workshop was inaugurated through a small speech in Mayan Tseltal given by the author, in which the nature of the event was explained, with the purpose that the participants recognize the importance of the practice of the diverse subsisting languages at the moment. 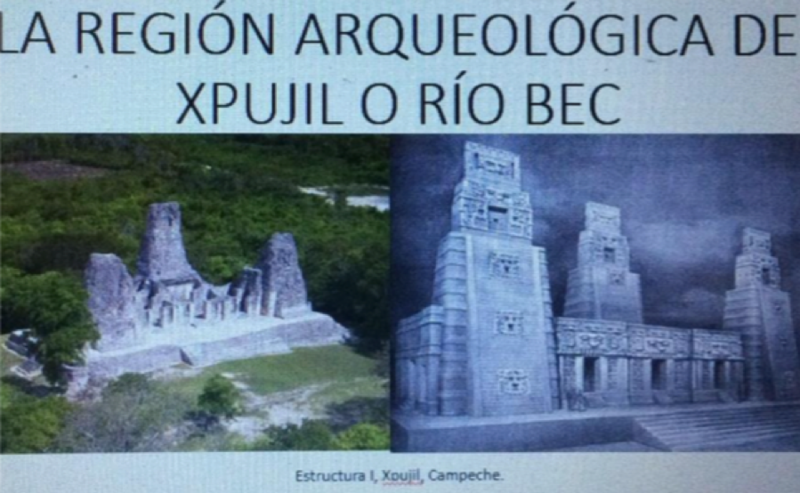 Due to the cultural context in which the municipality of Xpujil, Calakmul is located, a PowerPoint topic was prepared in which the archaeological heritage of the municipality was made known, as well as who occupied the area and how the Mayan culture managed to develop various cultural elements such as architecture, gastronomy, clothing, language, technology, but above all, writing. Some of these features are found today under the jungle and are part of our heritage. Hence the invitation to the participants to protect what we have inherited from our ancestors. Afterward, the subject of epigraphy continued, where we discussed the basis of the ancient writing of the Maya. For this, it was necessary to specify the characteristics of the syllabograms and logograms. In this section, the students did a small exercise in which they deciphered glyphs that represented words composed by syllables and words represented by logograms. The objective that followed for the next day was to start putting together a mini-stela for each one of the participants. However, before continuing with the exercises, the order of reading that a monument with hieroglyphic inscriptions should follow was explained; for clarification, Lintel 21 of Yaxchilán was taken as an example. Subsequently, the students divided their names into syllables (some even did the same with their surnames) in such a way that they could form cartouches through the use of syllables and logograms. Being familiar with these issues was not easy for the participants, they were given all the necessary attention. 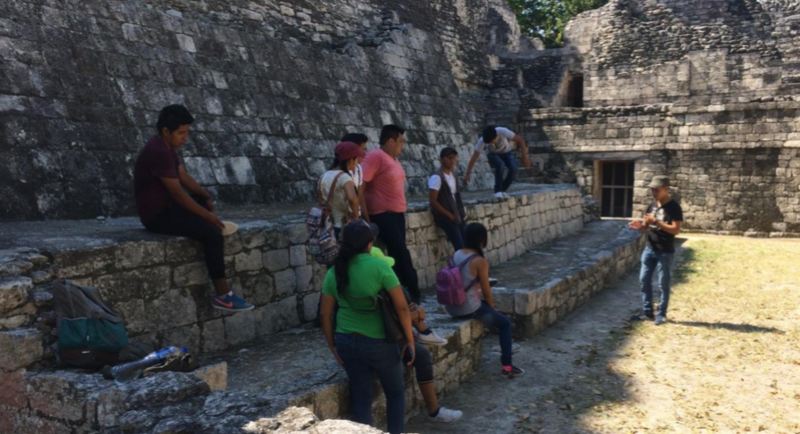 One of the activities scheduled for this course-workshop was to take a guided tour of the pre-Hispanic city of Calakmul, located approximately 100 km from the town of Xpujil. Due to certain circumstances, we could not undertake the reconnaissance of the site and its stelae. But fortunately, in Xpujil you have the ability to visit some of the cities belonging to the Rio Bec architectural style, such as Becán, where we made our tour and the study of a stela found in a good state of conservation. The guided tour covered crucial issues related to the cultural development of the ancient Maya, dealing with architectural issues, trade, art, and writing, among others. The students showed great interest in the knowledge of these topics, so it was a successful visit. Later, in the afternoon of the same day, we resumed the exercises. The stelae of the participants were still in development and to complement this, we covered some titles, trades and family relations so that young people could use to expand their monuments. 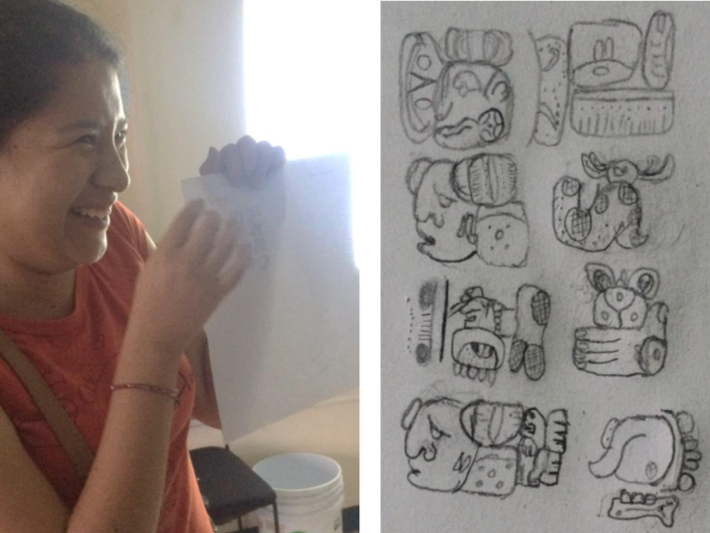 Finally, we saw a list of how the pre-Hispanic cities represented their names through the so-called Emblem Glyphs. With this, the students formed the last block of the exercise in which the students represented their names. The result of the activity was the elaboration of a mini-stela, which included the name of the person, their profession-title, to what family they belong, the name of their parents, and their place of origin. Each of the participants gave their best effort and some of the results were as follows. The students showed great interest in the learning about the numbers and the functioning of the calendar. 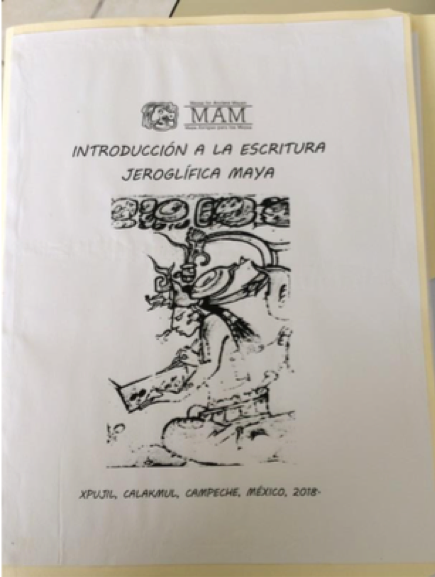 They hope to continue with the course, including more topics, with the aim of knowing and learning more about the interesting and important field of Mayan epigraphy. The course-workshop was closed by the words of each participant and the representative of the educational institution, who recognized each one of us; in my particular case for having taught the course, and for the young people for having participated in it. I first want to recognize MAM (Mayas for Ancient Mayan), especially Dr. Michael Grofe as the institution’s leader for the opportunity to carry out this activity in one of the most important cultural regions within the so-called Maya Area; Xpujil, Calakmul, Campeche. 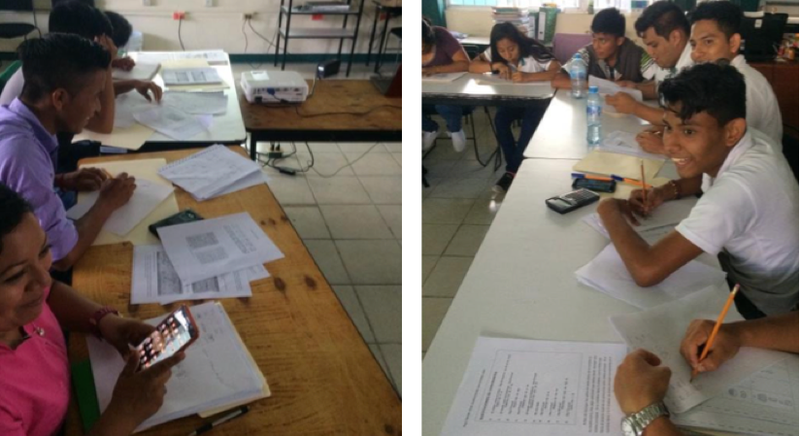 Also, we thank the Colegio de Bachilleres de Campeche (COBACAM), campus 14 based in this municipality, for their collaboration and coordination to carry out the respective activities with the students and facilitators of the academy. Mis sinceras felicitaciones al maestro Juan Jesús Méndez por emprender la iniciativa de difundir el aprendizaje de la escritura e historia propia de los mayas contemporáneos. A los participantes en el curso introductorio animarlos a seguir adelante. Vale la pena este tipo de actividades para las nuevas generaciones. A los directivos de MAM gracias también por el apoyo a este tipo de eventos. Sigan adelante.